This will lead to intelligent decision making abilities leading to improved efficiency and productivity for the same things which were earlier not part of the phenomena of Internet of Things. This has opened larger avenues for new types of products and services applicable to multiple industries. The sensors alone will just gather data, evaluates and measures it. This all will be meaningless if the sensors are not properly connected to the machines to actually leverage something out of data. The best way forward to actually harness the true potential of IoT is through cloud based applications. This is because an alternative is expensive – having a vast infrastructure in place for all the data gathered from the sensors worldwide. Hence, the role of Cloud based applications becomes critical. 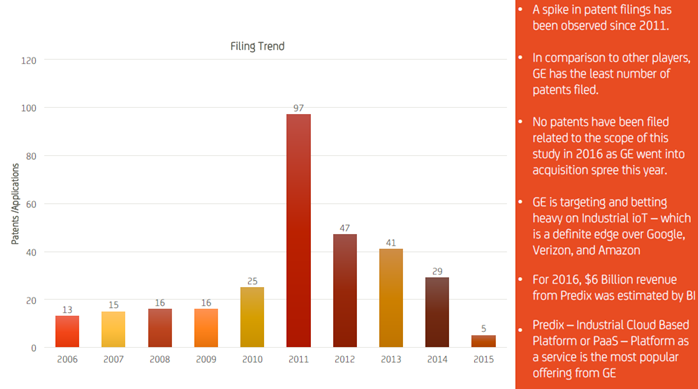 This is why the top companies we have analyzed in this report actually are the market leaders in terms of research and patenting activity. According to a study from Business Insider, The IoT will result in $1.7 trillion in value added to the global economy in 2019. That is a huge number. This industry is all set to take over the smartphone industry and the forecasts indicate more than 20 Billion devices connected by 2020. The main research focus has been on making the technology secure, robust, and more efficient. There are many verticals of adoption for the IoT, from wearable devices, to cars, smart homes, cities and industrial equipment. The global wearable market is expected to reach a value of around 53.2 billion U.S. dollars in 2019, more than ten times its value five years prior. It features items such as smart watches, fitness and health trackers, or even smart jewelry and smart clothing. Smart watches and health & Fitness trackers are expected to account for more than 70 percent of all wearable’s sales worldwide in 2016. Another Industry that has grown significantly is the Smart homes industry which is expected to be roughly of around US $60 Billion by 2020. McKinsey Global Institute predicts that by 2025 the Internet of Things will generate up to $11trillion in value to the global economy. Moreover, Software and services is pegged to be a $600B market by 2019, attaining a 44% CAGR from 2015 to 2019. These facts from Business Insider also predict the number of devices connected via IoT technology will grow at a 35% CAGR from 2014 to 2019. 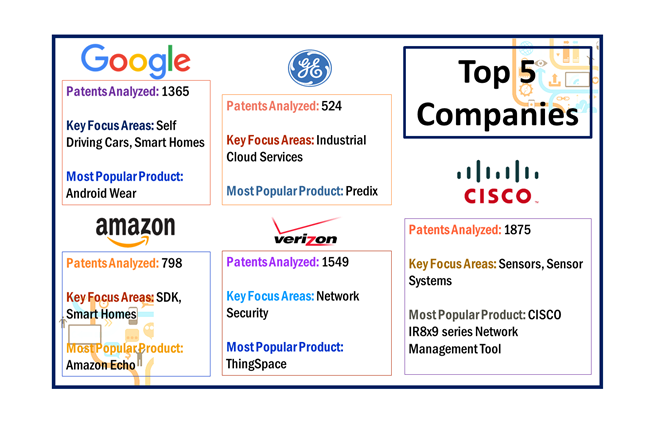 As we cover the Intellectual Property patterns of the five of the market leaders, we can realize how this fast evolving market is shaping up over the next five years. It should be noted that analysis related to top five companies in IoT for 2016 have been covered in this report. 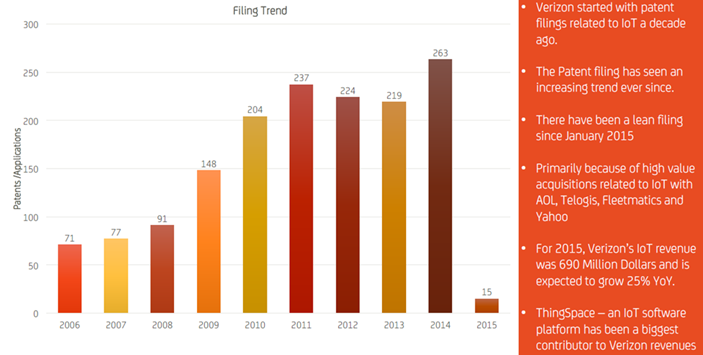 The charts represent the patent related figures for the data gathered upto October 31, 2016. We have tried to cover maximum industries possible related to Internet of Things. However, these should not be assumed to be an exhaustive list of applicable industries. The revenue related information and other market figures have been relied upon from other web resources such as Gartner, McKinsey and other technical blogs. Google Buying Nest in January 2014. Google purchased it for 3.2U.S. $ Billion. This bolstered the Google’s portfolio of Smart homes. Google acquired DropCam through it’s Nest Labs subsidiary in June 2014. Dropcam is an American technology company headquartered in San Francisco, California. The deal was finalized for U.S. $555 Million. Google’s £400 million acquisition of DeepMind happened in 2014. DeepMind is a British artificial intelligence company. 2016: Cisco completed acquisition for Jasper for $1.4 billion. Japer is a cloud platform for IoT services such as connecting devices, delivering analytics and automating business functions. 2015: Cisco acquired ParStream, a privately-held company based in Cologne, Germany which develops highly specialized analytics databases built to analyze large amounts of data and store it in near real-time, anywhere in the network. 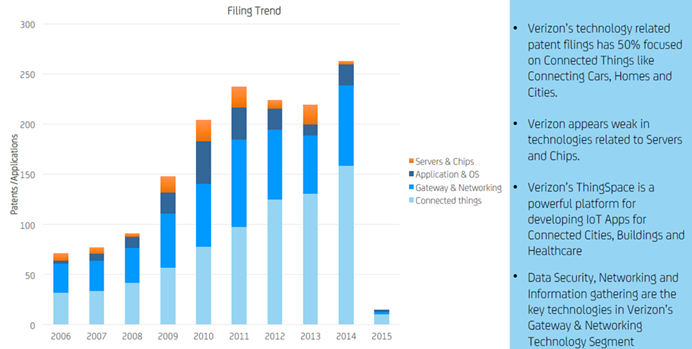 2015: Cisco acquired Piston Cloud Computing. Piston provides software that enables streamlined operational deployment of large scale distributed systems. Piston’s enterprise grade software helps customers automate orchestration and deployment of underlying distributed systems for running applications on OpenStack. 2014: Cisco acquired Metacloud. Metacloud deploys and operates private clouds for global organizations with a unique OpenStack Private Cloud as-a-Service. Integrated Service router – IR8x( Series with embedded GPS and other sensors. Cisco Mobile IP Gateway 2450 – Improving communication between the Back office and Transit vehicles. Cisco IoT Field network Director Software Platform. Cisco IoX: Cisco IOx provides uniform and consistent hosting capabilities for fog applications across Cisco IoT network infrastructure. 2016: Sensity Systems Inc., a private company based in Sunnyvale, California. It was acquired in September 2016 to bolster their Smart City Initiative. 2016: LQD WiFi – a New York based company was acquired to further strengthen Smart City portfolio. 2016: Verizon acquired Telogis in June 2016 for its highly successful cloud based vehicle fleet management software. 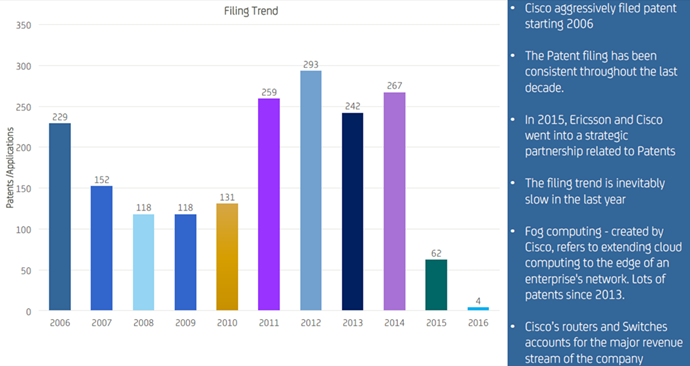 2016: Fleetmatics – another telematics company was acquired by Verizon. The AOL acquisition of 2015 was indirectly aligned with Verizon’s IoT strategy by using Video and Advertising distribution technologies from AOL. 2012: Hughes Telematics was the first company related to Telematics that was acquired by Verizon that kickstarted their IoT startegy. 2016: NICE, based in Asti, Italy, which develops software and provides services for “high performance and technical computing” was acquired by Amazon to further boost Amazon Web services. 2015: Amazon acquired a Portland based video processing company Elemental Technologies. 2015: Israeli chipmaker Annapurna Labs, purchased for a reported price of $350 million which indicates Amazon’s entry strategy to develop servers and chips to connect the things worldwide. AmazonDash – The Dash tool let’s user create their grocery list on Amazon by scanning barcodes on products at home. 2016: Shipexpress a supply chain company was also acquired to tap into efficient railway shipping and transportation. 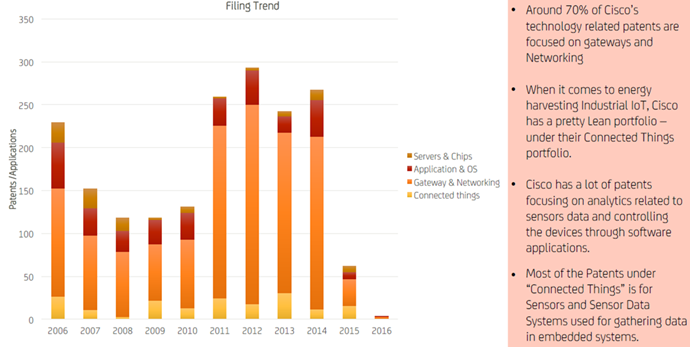 IoT adoption stands to grow significantly, in the next 18 months. It is likely because of falling costs, the continuing convergence of data and services and ever-increasing IoT technology simplification—a factor of utmost importance to consumers in particular. With simplicity at its core, Homeowners can look forward to address a range of everyday issues, from controlling and monitoring home security and environmental conditions to monitoring their teenagers’ driving habits. The cost efficiency, convenience, simplicity and security of connecting things will drive wider societal changes. This will eventually lead to increase in sharing economy with the growth and flourish by the use of connected cars and household gears. With the increased use of connected devices, the Neighbors can easily check for car’s availability in their neighborhood for pooling and likewise whose household tools they can borrow to get the work done rather than going through the whole process of going to the store spending huge sums and buying the tools which apparently will hardly be used after the work is done. Eventually, the ability to track usage will create new service categories. Rates for insurance and healthcare will be based on usage and behavior, which can be tracked through IoT. With technology identifiable by everyone in today’s world, Innovation, productivity and value will thrive as private companies and the public sector both come to the inevitable conclusion that IoT is imperative to delivering the integrated, easy to use and sustainable products and services. 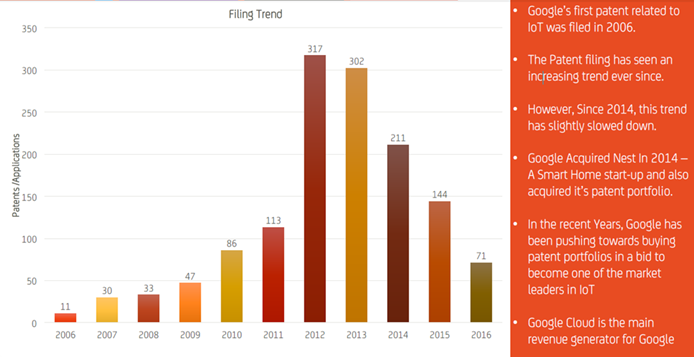 Citius Minds is a leading technology consulting firm supporting clients in advanced patent analytics and end to end patent litigation services. Together, Citius Minds’ founding consulting experts have more than two decades of experience supporting the world’s leading companies and law firms in their IP management needs. Disclaimer: This document is intended for general informational purposes only, does not take into account the reader’s specific circumstances, and may not reflect the most current developments. Next post: Copyright Licence or Copyright Assignment?